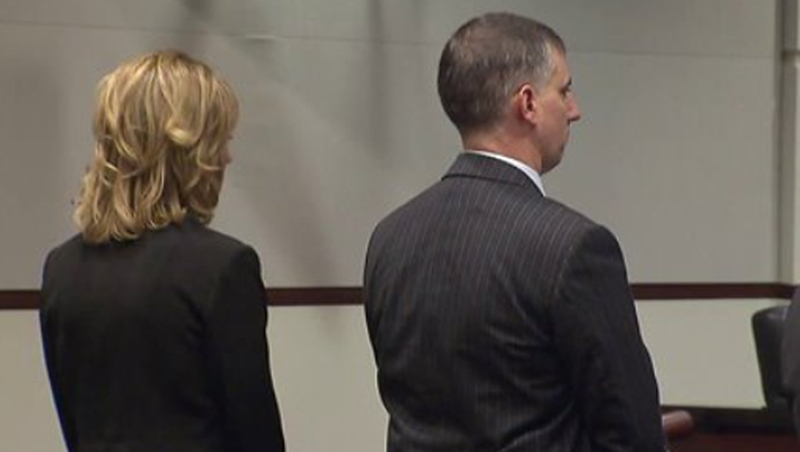 PORTSMOUTH, Va. -- A jury convicted a white former police officer of voluntary manslaughter in the shooting death of an unarmed black man accused of shoplifting. Portsmouth Officer Stephen Rankin, who was fired as he awaited trial, shot 18-year-old William Chapman in the face and chest outside a Wal-Mart store last year after a security guard accused the teen of shoplifting. No video recorded the killing, and testimony conflicted on the details. The ruling came Thursday afternoon amid the second day of deliberations, a week after opening statements launched in the trial, reports CBS affiliate WTKR. The station reports Chapman's mother cried as the verdict was handed down. The jury did not convict on the first-degree murder charge prosecutors sought. But criminal charges are rare in police-involved shootings, and convictions are even more uncommon. Experts say on-duty officers kill about 1,000 suspects a year in the United States, but only 74 have been charged since 2005. Of those, a third were convicted, a third were not and the other cases are pending. Prosecutors said the officer could have used non-deadly force, noting that every witness but Rankin testified Chapman had his hands up. But the defense said Rankin had to shoot after a stun gun failed to stop the teenager. The jurors - eight black and four white - began deliberating on Tuesday in the mostly black city of 100,000. Many in Portsmouth saw the trial as a chance for accountability amid continuing incidents of police-involved shootings around the nation. Rankin had already killed another unarmed suspect, four years earlier. But his lawyers said this case had nothing to do with deadly uses of force against other black men. Persuading a jury to convict in these cases is always difficult because people tend to give police the benefit of the doubt, said Philip Stinson, a criminal justice professor at Bowling Green State University in Ohio. "Juries are very reluctant to convict an officer because they all recognize that policing is difficult and violent," Stinson said. During the trial, Rankin took the stand in his own defense. He said he calmly approached Chapman to discuss the shoplifting accusation and was preparing to handcuff him when the teen refused to comply with his orders and a struggle ensued. He said he used his stun gun on him, but Chapman knocked it away and both men then faced each other from a short distance. That's when he drew his pistol, Rankin said, and repeatedly commanded Chapman to "get on the ground." Instead, he said Chapman screamed "shoot me" several times before charging at him from about six feet away. He said experienced "tunnel vision" at that point, and fearing for his life, fired twice to stop him. "I had no reason to think he was going to stop attacking me," said Rankin, 36. "I was scared." Some witnesses backed Rankin's recollection. Paul Akey, a construction worker who was nearby, said Chapman "went after the officer with throwing fists, and it looked like he knocked a Taser out of the officer's hands." But Gregory Provo, the Wal-Mart security guard who reported the shoplifting allegation, testified that Chapman never charged at the officer. He said Chapman raised both hands, boxing-style, and said "Are you going to [expletive] shoot me?" before Rankin fired from about five yards away. Prosecutor Stephanie Morales argued that Rankin chose to shoot when he could have used non-lethal force. "He brought a gun into what is at worst a fist fight," she told the jury. But defense attorney James Broccoletti said shooting was his only choice after "everything he tried to do didn't work." Prosecutors failed to persuade the judge to allow Rankin's ex-wife to testify that he had fantasized about shooting people on the job. In his first on-duty killing, he was cleared of wrongdoing after firing 11 times at a white burglary suspect. He said that man charged at him while reaching into his waistband with his hands. The judge also refused to allow testimony about Chapman's own criminal record. Additional witnesses were expected to take the stand before the jury again deliberates, WTKR reports, this time to recommend a sentence for Rankin.